Enshrined in Monument Park by the Yankees on Old Timers Day in 2015, Stottlemyre had a career record of 164-139 with a 2.97 ERA and 1,257 strikeouts from 1964-74. He won 20 games or more in a season on three occasions (1965, ’68 and ’69), lost 20 games in a season (1966) and was a five-time All-Star selection. He had seven career home runs, including an inside-the-park grand slam in 1965, and once had five hits in a game. 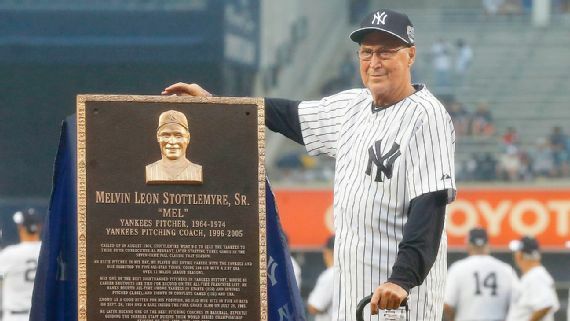 After a two-season stint as pitching coach of the Houston Astros, Stottlemyre rejoined the Yankees in 1996 and quickly factored into the team’s success as they won the World Series that season — the first of four championships, including three straight from 1998-2000, with him in that role. Roger Clemens, Andy Pettitte and Mariano Rivera were some of the pitching stalwarts of that era.